This now-deleted tweet by Wesley Chu, a science fiction author and alum of the University of Illinois, clearly demonstrates that he is not only a racist but is enormously ignorant of the South and American history. The Pee Dee region of the Carolinas where Hurricane Florence has done much of her damage is made up almost exclusively of large populations of blacks and a disproportionate number of poor whites. The South has historically struggled long before the Civil War began to reach the economic and educational heights of its northern neighbors and continues to do so today. Chu’s ignorance of the poverty of eastern North Carolina and South Carolina residents is glaringly obvious. Millions of people found themselves trapped in small, economically disadvantaged communities as Florence approached the coast, where 6 in 10 people are on government assistance—both black and white. 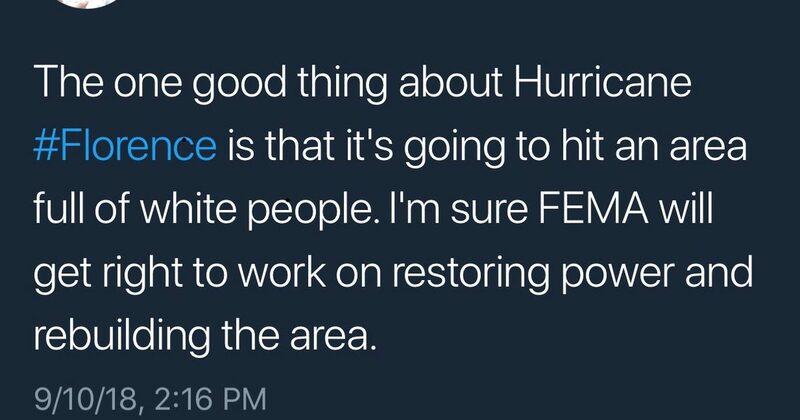 As was the case when Hurricane Katrina rolled over Louisiana and Mississippi, the poorest people living along the coast and in the Pee Dee’s sand hills are unable to flee a potentially dangerous storm like Florence, not because of the color of their skin but because they lack the funds to do so. And like the majority of poor blacks who were trapped in New Orleans, many poor in the Carolinas do not own a car or have access to internet news. They are unable or unaware that there may be transportation to shelters or someone willing to assist them in fleeing. Compounding the problem is that, unlike the poor of New Orleans during Katrina, who were mostly living in run down shot-gun homes, a majority of the poor in the Carolinas live in trailers, wholly inadequate to ride out a powerful storm like Florence. Poor whites and blacks were pushed into the flood-prone sand hills of the Carolinas more than a century ago as wealthier northerners bought up land where the soil was richer and they were not prone to flooding. Today, these same wealthier Americans never really “see” these same communities as they pass through on their way to the beach in their shiny SUVs, but they are everywhere and the poverty is undeniable. In small Carolina communities, town sidewalks and infrastructures are crumbling, store fronts boarded up and long swaths of economic blight mar the pine scrubbed landscape. Outside of agricultural work or work in the meat packing industry, there is no information technology in these states. Even the great mills that used to keep the South humming in low-wage jobs left long ago with their international corporate owners for ever cheaper labor in Mexico, India, Thailand, Vietnam and China. The ghost communities in the invisible South are often lacking in young people capable of giving back to their communities, particularly in emergencies. Those lucky enough to make it out of these destitute and dying communities do so by joining the military or attending college. And they don’t come back. What is left after the brain drain are the infirm, addicted and elderly. It’s as if the information age never arrived in these communities. Jobs and resources for millions of people in the small and struggling towns that make up the Pee Dee simply do not exist, so when I see hateful and uninformed tweets by self-loathing whites or university grads who want to virtue signal at the expense of those who will suffer most from Hurricane Florence, it makes me angry. Chu thinks this is about white privilege, but he is wrong. It’s about economic privilege. It’s the educational and economic gap sociologists refer to when they speak of two Americas. Predictably, the social justice warriors who wish to tear down our nation for their global utopia have no real knowledge of their own country, its people and its history. As fools like Kaepernick take a knee to the American flag and eschew the national anthem and white college students tear down historical statutes, they remain irredeemably ignorant of the actual real people who live outside of their liberal bubbles. British colonizers were looking for a place to stow their undesirable “breeds” and were instrumental in populating the South with a people who they referred to as “waste people”—the uneducated and criminally inclined. All of which brings me around to my final analysis of people like Chu, who wish to believe that everything is about race, when class and culture play a far more significant role than they wish to acknowledge because it would shatter their notion that America, unlike Britain, has a class system. Like religious zealots with no historical knowledge, they sincerely believe that if only those hateful, privileged whites would remove themselves from society, we would all be better for it. The colonists who came to the Deep South were the bottom of the heap and held no social collateral in a system that wished to be rid of them. They were poor men and women from the criminal classes. Irish rebels, whores and an assortment of convicts were shipped to the New World by more advanced societies wishing to be rid of them. Working alongside the “waste” people of Europe where black slaves, who often fared much better than their white unemployed peers and who, like blacks, owned no land and were also forced into the sandy Pee Dee region of the Carolinas to eek out a meager existence on family sustenance farms. Even today, the “clay eaters” and retrobates of the South are a source of derision by Hollywood and the educated elite, of which Chu is part of. 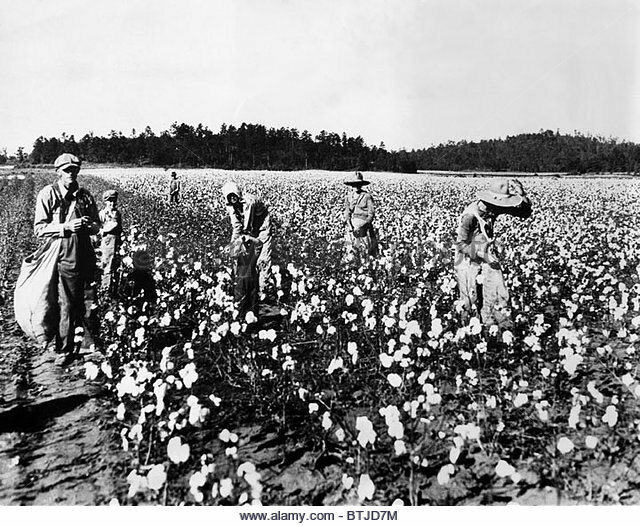 As late as the 1930s, poor white southerners could be found picking cotton in the South. In his rush to virtual signal, Chu unintentionally shows himself as identifying more with Hillary’s hatred of Deplorables and his own membership in an educated class that is far removed from the poor whites of the South, where both poor whites and blacks share a similar cultural heritage of want and lack. Yet, it is people like Chu who remain safely in their latte-sipping, boho urban communities tirelessly seeking “authenticity” that are completely clueless to the plight of millions of poor Americans in their own nation. Chu’s virtual signaling was clearly meant to impress those who belong to his own class of privilege and who believe that race is the cause of all economic and cultural dysfunction. For a college boy, he sure is stupid. 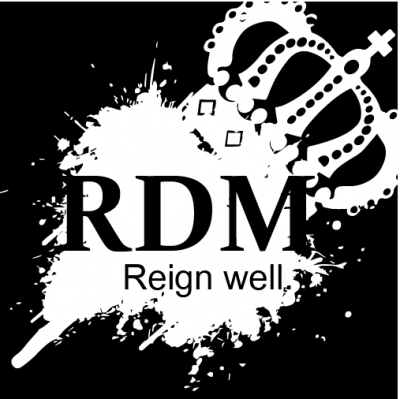 #Reign well.